I’m a New York native, and I’ve visited the American Museum of Natural History on the Upper West Side of Manhattan many times and it never gets old. There’s a reason that it welcomes 5 million visitors per year - and that’s because it’s incredible. It’s billed as being the NYC tourist attraction that comes as close as possible to summarising all human knowledge in one building – and I’m pretty sure that statement must be true. Inside the grand building, you’ll find four floors packed with exhibits. It’s impossible to see it all in one visit, so I’d definitely recommend downloading the AMNH Explorer app ahead of your visit – you can customize your own tour, take part in a treasure hunt, or find the nearest restroom. To get the best out of your visit, make a plan of all your must see items amongst the 32 million (yes, 32 million!) artefacts, set across 25 buildings and four blocks. I think the best place to start is the iconic dinosaurs and fossils. You’ll see a T.Rex, and a Titanosaur – a relatively new discovery in the world of dinosaurs, so called because of its length, and at 122 feet it can’t even fit inside this incredible hall – instead his head sticks out of the door – which is a memorable welcome to visitors of all ages. The hall explores all the big questions about dinosaurs. Staying on the theme of animals, take in the mammals on floors two and three. The exhibits are incredibly lifelike, and what’s fascinating is that every type of animal we’ve ever known about seems to be represented at the museum. The Hall of Ocean Life’s famous Blue Whale is an image that always stays with me. It’s an incredible sight – all 94 foot of it, hanging from the ceiling, showing just how small us humans are. More proof of our small size, if it were needed, comes in the Rose Center for Earth and Space, which includes the Hayden Planetarium – a virtual reality theater. Time your visit to take in the show here – Dark Universe, narrated by Neil DeGrasse. It focuses on the part of the universe that we can’t yet see, which is a whopping 95% of its entirety! This time of year, you’ll be able to experience The Butterfly Conservatory. Open from September through May, it’s an almost tropical plant filled paradise, with hundreds of beautiful butterflies fluttering around. I can manage about fifteen minutes here – but it’s pure bliss. A reminder of how wonderful nature is in this buzzing metropolis. 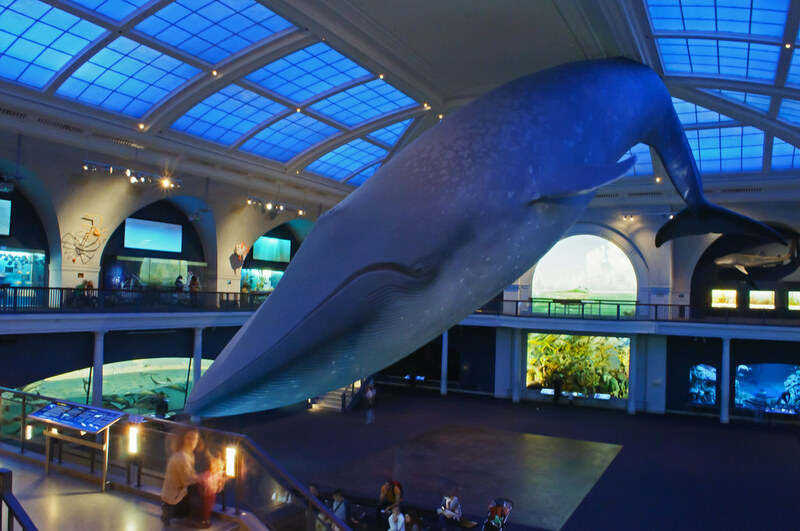 So, the American Museum of Natural History is a must see on your New York City itinerary – whatever your age or stage in life! Before you arrive, be sure to check out what special exhibits the museum is hosting. These change regularly and offer further insight into the museum’s current topics. Also – take a look at what’s showing at the awesome IMAX Theater. I’ve visited this museum many times, its a place that keeps on giving. I always discover something new, as well as rediscovering old favorites. Before I sign off, I’ll share our top tip: one of the best sure-value ways to visit when you come to New York is to check out our FreeStyle Pass New York – where you can have unlimited service on our Hop-On Hop-Off buses (which pass the museum) as well as entry into your choice of three, five or seven NYC attractions, including the American Museum of Natural History. Visit our website and contact us for more details on how we can help you tour New York City.